I hate hoaxes. I hate hoaxes because I search for the truth and demand answers. In the words of Lt. Joe Kenda, “Mysteries make my head hurt.” I’m like House, M.D. Everything has a solution and I can’t rest until I know what it is. 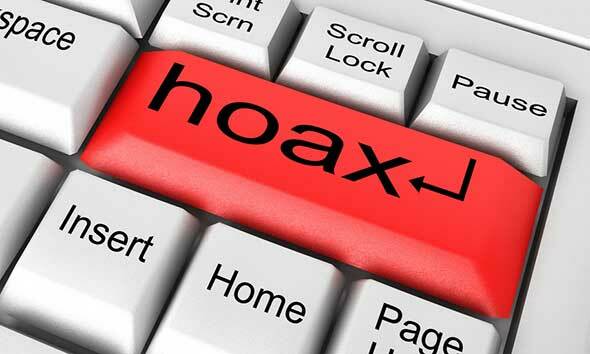 The problem with hoaxes is the unbridled rumor, innuendo, and lying that goes along with them. At least we have Snopes.com to help me out a bit. In law school we learned the “real” case of the McDonald’s law suit. You know, the one where the lady sued for the coffee being too hot. I won’t go into details but suffice it to say that if you knew the case, you’d know McDonald’s was seriously at fault. Now every law student in the United States has to correct people when they say “What about that lady who sued McDonalds over hot coffee?” Among millions of other cases. That happened back in 1994 – 20 years ago – and its still wrong and all over the world. That is what’s wrong with hoaxes. They spread lies. They can cause disaster. The runaway bride that cost tax payers a fortune looking for her when she pretended to be kidnapped. The balloon boy that had a nation on the look out. I just heard of one involving Shakespeare last night. Actually quite funny. One of the worst from a paranormal stand point would be the Lutzes. The Lutzes were the family that moved into the Amityville house after the Defeos were… removed from it. They perpetrated a great hoax, claiming all kinds of demons and hauntings. It was a paranormal circus. The Lutzes were eventually outed and forced to move, literally, across the country. Of course the movie and books based on their claims made an absolute fortune, and isn’t that why people perpetrate hoaxes in the first place? Right now I’m smelling a hoax. It’s not of the staged variety as much as the Lutzes or Balloon Boy or Runaway Bride. I think it snowballed. I’m talking about the allegedly haunted house in Gary, Indiana. First, let’s check out the evidence. Yes there are reports from supposedly credible sources like cops and Child Services workers. There is one potential picture and one alleged EVP. First, the EVP is crap. There’s a basement full of investigators and you catch a whispered “Hey!” and don’t think it’s someone in the room? Cmon. The picture is dicey, as most paranormal photos are. In fact, another paranormal group insist it was a hoax from that cell phone app that randomly adds ghosts in your photos. There were no complaints from previous tenants until this one family moved in. The family is currently fine. The new owner has had the house blessed several times. There were no actual scientific researchers brought in to investigate claims of the paranormal but the fact that Child Services was called causes me concern. DFCS doesn’t just show up to randomly check on people. Someone had to have called and lodged a concern or complaint about the safety and/or well-being of those kids. My other concern is about the situation and its similarities to Hollywood. One group likened it to Amityville (demons show up and haunt a family!) and I instantly recalled the 6th Sense. You know, the scene where the hospital worker accuses the mother of child abuse when its really the ghosts? Interesting, isn’t it? Plus the claims of swarms of flies like those in The Exorcist. Also like The Exorcist the mother has claims of levitation of her children. Psychiatrists and psychologists became involved and said the kids were just doing as their mother told them and so she needed to (1) get a job, (2) move, and (3) stop talking about demons. The Landlord rented out the place before someone bought it and said he never had complaints after they left, either. Now the former owner is saying she would never make up such a story, because they almost lost their lives and no one benefits from it. Liar, liar pants on fire. We all know the reason that people do anything: MONEY. And if you’re unemployed, living with your 3 kids and your mom, you need it. A LOT of it and I’m guessing pretty darn quick. TV fame is the quickest and easiest way. Besides, who can argue with a ghost?